**Note from Stephanie: This is a guest blog post by Bryson Meunier, a Chicago-based SEO and Director of Content Solutions at Resolution Media, an Omnicom Media Group Company. His career at Resolution Media has given him the opportunity to help some of the world's top brands achieve success in mobile and SEO including: Lowe's, LeapFrog, Apple, Groupon, FedEx, and others. There are a lot of opinions on how to do mobile SEO right these days. Do you need to build a separate mobile site, or is it enough to make your website responsive, so that it reformats for the device that’s accessing the content? Or can you skip all of these entirely and simply make your web site accessible to and readable on devices of all kinds, like Apple.com has? I’ve been researching mobile SEO best practices since that meant making your site accessible to PDAs, and I’ll be giving my own professional opinions on the subject at SMX Advanced in Seattle this year during the iSEO: Mobile Search Engine Optimization Done Right panel with Cindy Krum and Google’s Pierre Far. But before I gave my considered opinion, I wanted to see what the most successful web sites are doing today, if anything. 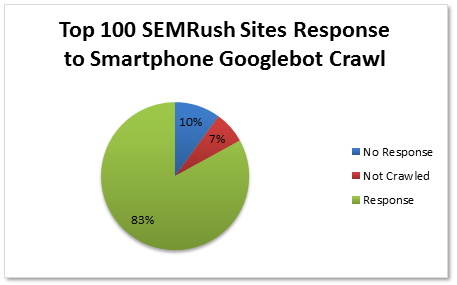 To that end I looked at the sites getting the most traffic from Google on the Internet according to SEMRush, and crawled them with Google’s smartphone Googlebot user agent. They did nothing in response to smartphone Googlebot. This is either because they have a site that they think provides a good experience on smartphones, or they have a mobile site or responsive site and it simply didn’t recognize smartphone Googlebot as a mobile user agent that required a mobile experience. They redirected smartphone Googlebot to a mobile URL. This was usually an m dot subdomain (e.g. m.yahoo.com, en.m.wikipedia.org), but was sometimes only a parameter or a separate URL that indicated somehow it was intended for access from mobile devices. Exactly one time it was a separate dotMobi TLD. They didn’t change the URL, but did reformat the site for easier mobile browsing through responsive web design. It’s worth noting that I could not crawl 7% of the most popular sites. Six weren’t crawled because they weren’t safe for work (and not really that relevant to what most white hat SEOs are going to be doing anyway) and one because it returned a 404. Responsive Sites or Mobile Redirects? Given the uproar in the web design and SEO community recently over Jakob Nielsen’s recommendation to build both a mobile site and a full site, I half expected the majority of the sites crawled to return responsive web sites rather than mobile sites on separate URLs. There’s a popular theory among SEOs these days that mobile URLs dilute link equity, making the site less competitive for search; and if that was the case I would expect the majority of these sites to be responsive, since that’s apparently more competitive than sites with mobile URLs since responsive design uses the same URLs and doesn’t split link equity. I also wasn’t sure if any of the sites would be prepared to welcome smartphone Googlebot, given that it’s only been around for about 5 months and the results are currently spotty at best. Knowing how slow large websites (especially those run by large corporations) can often move, I thought that adoption would be low, if anything. Our hypothesis, then, was that these 100 sites that get the most organic traffic from Google would not serve mobile URLs, as the split link equity from mobile URLs would make them less competitive in organic search, making it difficult for them to get enough organic traffic to be in such an elite category. More likely the sites would use responsive design, as for whatever shortcomings it has it uses the same URLs as desktop and does not split link equity. Furthermore, we hypothesized that not many sites would do anything special for smartphone Googlebot, as it has only been around for 6 months at this point, and adoption seems to be low given that the smartphone search results are still largely populated by desktop web sites. What I found was just the opposite. 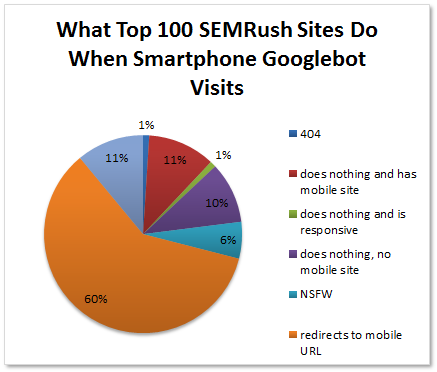 Of the 100 sites, 83% of them took smartphone Googlebot to a separate mobile user experience, and only 10% did nothing. Of the 10 sites that didn’t take smartphone Googlebot to mobile content, more than half of them have mobile or responsive sites and are likely not redirecting the bot because they’re unaware of its existence or have yet to implement the change. This is much higher than I was expecting and suggests that the great majority of sites that get the most traffic from Google are looking for a way to make their mobile content visible in Google smartphone results today, rather than waiting for next year or more budget to make simple fixes that will result in more mobile search traffic. This may be why they get more organic traffic from Google than most of us. How they actually responded to Googlebot might surprise some SEOs, as a full 60% of the sites redirected to a mobile URL, while only 11% of the sites were responsive. When we account for the sites that may have mobile content but didn’t redirect it, we see that 83% of the top sites either have mobile sites or responsive sites, and 71% of them offer mobile sites at mobile URLs. You may have heard the “one URL to rule them all” line or read Duane Forrester of Bing’s plea to use one URL for each piece of content and thought that mobile URLs would be detrimental to link equity. It’s reasonable to think that duplicate content would cause problems with canonicalization and ranking as it does in desktop search for things like printable URLs and indexed session IDs. Some have recommended responsive design as the best way to build a mobile web site in order to avoid this split link equity. There are good reasons to use responsive web design, and 12 of the top 100 sites have made their sites responsive. However, as 71 of the top 100 traffic generating sites in Google use mobile URLs, it’s unlikely that this is a serious issue for ranking in Google. True, this is only a sample of 100 sites, but they are the sites that get the most organic search traffic on the Internet. They could clearly be doing more to optimize for mobile search traffic, in my opinion, but the fact that they’re getting more overall traffic than most of us means they can’t be doing everything wrong. This study is also consistent with findings from Mongoose Metrics that showed the majority of sites in the Quantcast Top Million redirect to mobile URLs instead of using responsive web design. At around 52%, however, their majority is not as clear as the 71% of top performing sites in this study that display mobile URLs. Many methods can work for mobile SEO as there are responsive sites and sites without mobile content in this list of top performers as well; but if we’re following the leaders toward best practices we must consider the option the majority of them use, which is redirecting to a mobile URL. In conclusion, contrary to much of what you read these days from my mobile SEO colleagues and other advocates of responsive web design in all cases, we found that most of the sites that get the most organic traffic didn't use responsive design. This could be a positive indication that certain sites should continue to build a separate mobile site because the split link equity is either recognized and properly handled by Google with the Skip Redirect update, or it’s not enough of an issue to make a site less competitive in search. 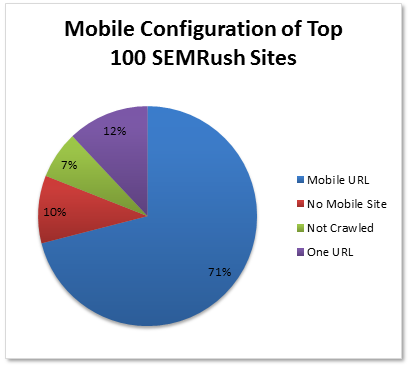 There’s more to mobile SEO than redirecting or reformatting, of course. There are a number of best practices to consider, some of which are true, and some of which aren’t. I will be going over a study of the smartphone search results at SMX Advanced that tries to get at what is most important in terms of mobile search ranking factors. We released a part of it earlier this year that demonstrates an unusually high number of sites with mobile versions ranking in Google smartphone search, but will be discussing even more ranking factors at the conference. If you have tickets already, be sure to join us June 6, 2012 in Seattle at iSEO: Mobile Search Engine Optimization Done Right and at the Local University Advanced workshop, where I’ll be talking about mobile search ranking factors in detail. If you’re interested in mobile search and you can’t make it to SMX, be sure to read my blog and/or the mobile search column in Search Engine Land, where my fellow columnists and I write weekly about all things mobile SEO.